When I was asked to give a speech at an investment conference in Croatia, I was excited for a number of reasons. Many years ago, I had visited Chile and wanted to learn more about a mining company there. Its CEO happened to be a Croatian who had immigrated to Chile and became quite wealthy. At the time of our meeting in the late 1990s, we traveled together to a large Chilean copper mine and he showed me the entire operation. I got a fairly good understanding of copper mining as well as his grand vision to convert formerly defunct state-owned enterprises in Chile into profitable companies. I remember standing with him in front of a derelict beer brewery. At the time, he told me that he would acquire it and transform it into a successful enterprise which, in fact, he did. A number of years later, I visited Dubrovnik on the Croatian coast. A UNESCO World Heritage site, it is a picturesque, medieval fortified town. I learned that the family of the CEO I had met in Chile had a hotel on the cliff overlooking the town. I certainly was interested to see how things had changed in Croatia since my last visit. The metal tie had a lace pattern on it, and the package containing it said: “Pag lace – a type of lacework from the island of Pag, listed under the UNESCO Intangible Cultural Heritage List.” On the back of the package was a history of the cravat in seven languages. Apparently, in the 1600s, a group of Croatian mercenaries supporting France’s King Louis XIII wore colorful knotted scarves. These scarves were distinct and interesting to the French, who at the time used the starched linen ruffs around their necks. The idea not only caught on in France but in England where Charles II introduced it on his return from exile in France. Unique things and good taste have not gone out of style in Croatia. It isn’t surprising that travel and tourism are a big part of Croatia’s economy—accounting for about a fifth of gross domestic product (GDP)—given its beautiful beaches, great food and mild weather. During my recent visit, I took a short walk from my hotel on the Adriatic coast to an old fishing port town, Rovinj, located on the west coast of the Istrian peninsula. 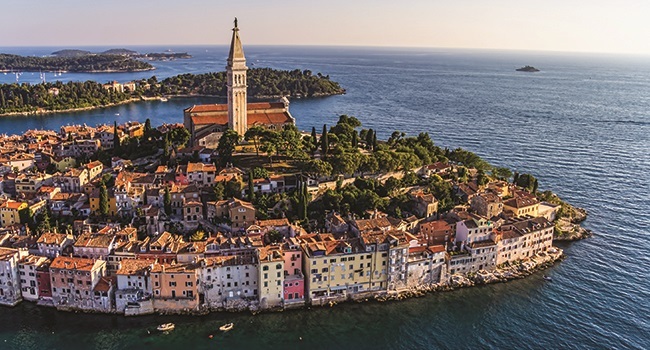 The town has a mixture of Croatian and Italian features and both Croatian and Italian are widely spoken there—both are official languages in the Istra region. Many (if not most) Croatians speak a second language. At various times, the town as well as other parts of Croatia were part of the Roman, Byzantine, Frankish, Venetian and Austrian empires. Traces of all of those influences can be seen in parts of walls, fortresses and buildings, including a church steeple that looks very much like the bell tower in Venice’s St. Mark’s Square. From the waterfront, I saw a huge construction site along the opposite coast of the bay with seven large cranes at work. It was a large development project that apparently is tied to expanding tourism. Not too far from Rovinj is Pula, another picturesque town we were able to visit. The most outstanding feature of the town is the Roman Arena, which is very well preserved and similar to Rome’s amphitheater. Wandering around the town’s old district, we came across an incredibly beautiful Roman temple, which is thought to have been built in honor of Emperor Augustus. Coming across this building in a deserted square bathed in moonlight transported me back in time. We also saw some of the large stone triumphal arches and gates that the Roman had built. We can’t talk about Croatia without at least mentioning former Yugoslavian President Marshal Josip Tito. After World War II, Tito was a co-founder of the Non-Aligned Movement, a group of states not formally aligned with or against any major power bloc. Tito created Yugoslavia, of which Croatia was a part of until gaining independence in 1991 following a four-year struggle. Apparently, one of Tito’s favorite places was the island of Brioni. On our time off, my colleagues and I were able to take the short ferry ride to the island, which is now a national park. It’s a beautiful spot and it’s no surprise that the remains of a Roman villa are there as well as evidence that the Austrian aristocracy vacationed on the island when the area was under Austrian rule. At one point in the late 1800s, a Viennese millionaire bought the island to create a vacation health resort. After World War II, President Tito made it his personal summer residence, so a number of pavilions and other buildings were constructed for him, his security contingent and official guests. Tito hosted films stars like Elizabeth Taylor, Richard Burton, Sophia Loren and Gina Lollobrigida as well as many heads of state such as Egypt’s President Gamal Abdel Nasser, India’s Prime Minister Jawaharlal Nehru and other members of the Non-Aligned Movement of countries who opposed the Cold War. We visited one villa near the ferry landing where there was an extensive collection of photos of those days showing Tito in his white suit hosting all those famous people. When Tito died in 1980, the island became a national park. Today, tourists are able to stay for the day or check into one of the 1960s-style hotels for a longer visit. Tito’s old car is the only automobile allowed on the island. Visitors can rent golf carts or bicycles to get around. We chose the former to tour the island’s many sights, which included old Roman and Byzantine ruins, stone dinosaur footprints and an outdoor zoo. Some four million people live in Croatia and generally have a good standard of living, with a per-capita income of about US$23,596 per year, as of 2016.1 For perspective, across the Adriatic Sea, Italy has a per-capita income of US$38,160.2 Today, Croatia is part of the European Union, but it doesn’t use the euro. Of course, Croatia has its challenges. Like so many other countries around the world, Croatia does face corruption problems. Croatia had a score of 55 in Transparency International’s 2016 Corruption Perceptions Index, which is near the middle of the range from zero (highly corrupt) to 100 (very clean).4 In 2016, Croatian lawmakers had to dissolve the coalition government when there was a no-confidence vote that ousted the prime minister amid a corruption scandal after only five months in power. Speaking of scandals, I always enjoy taking questions from audiences where I speak, and after my recent presentation in Croatia, an attendee asked me which country in the world I thought was the most interesting for potential investment opportunities. My answer—Croatia—surprised everyone. I wasn’t just pandering to the crowd. One of Croatia’s largest private, family-owned companies recently unraveled and nearly triggered a debt crisis. In an attempt to avoid such a crisis, the government passed a law enabling it to take over the company in a kind of bankruptcy proceeding. Since the firm’s operations were not only in Croatia but also Slovenia, Serbia, Bosnia-Herzegovina and Hungary, the fallout from a collapse would be devastating. The holding company employed tens of thousands of people, comprised more than 140 firms and supported many suppliers who had extended billions of euro of credit. I think it might be necessary for parts of the company to be sold in the future in order to meet commitments. This could be an opportunity to restructure individual subsidiaries. However, the situation is still unfolding so we don’t know the outcome. Regardless, I’m looking forward to my next visit to Croatia, not only because of the potential investment opportunities that could be coming but also because of the wonderful culture and people. 1. Source: The World Bank, GDP per capita, purchasing power basis, as of 2016. 3. Source: IMF World Economic Outlook Database. There is no assurance that any estimate, projection or forecast will be realized. 4. Source: Transparency International Corruption Perceptions Index 2016.